The Book Chook: Children's Book Review, Yoo-Hoo, Ladybird! Children's Book Review, Yoo-Hoo, Ladybird! Yoo-Hoo, Ladybird! was written by Mem Fox, illustrated by Laura Ljundkvist and published in Australia by Penguin, 2013. 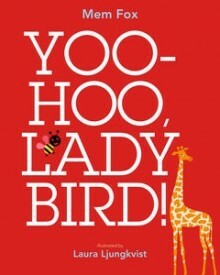 In the USA, you can find this children's picture book under the title, Yoo-hoo, Ladybug! and published by Beach Lane Books. It's also available as an e-book with audio from iTunes. I enjoyed this collaboration between one of my favourite writers (Fox - Where is the Green Sheep? and Good Night, Sleep Tight) and one of my favourite illustrators (Ljundkvist - Follow the Line.) It's a lovely, simple introduction to a find-the-picture activity for pre-schoolers with the added benefit of short rhymes to help develop their literacy skills. Ljundkvist's varied interesting patterns and styles in individual items on a page will encourage discussion and vocabulary acquisition. The amount of detail is moderate and the ladybird not too hard to find, so even toddlers will experience success with the finding game. As a follow up activity to sharing Yoo-Hoo, Ladybird! with kids, wouldn't it be fun to have kids create a simple puzzle page or book full of such puzzles themselves? They could draw, cut-out and/or take photos of objects in their environment, gather them in a collage, then create a cute little character to hide amongst them. I like hide and seek books as a great alternative to books, particularly when families are on the go! Puzzle books, picture books, ebooks, ANY books help kids to love reading, I believe.